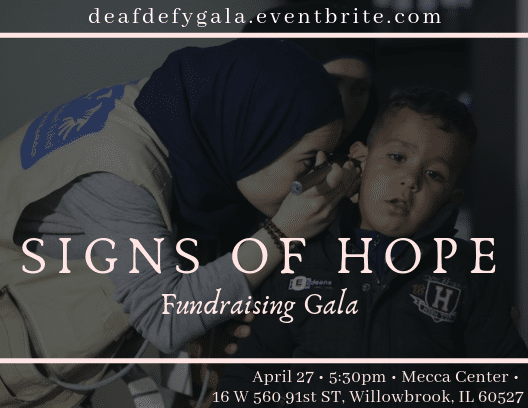 Join the Deaf Defy team for our second annual Signs of Hope Gala! All proceeds from this event will support our upcoming medical mission, bringing hearing aids and sign language resources to Deaf refugee children. For the past three years, our team has traveled to the refugee camps of Lebanon, representing the world’s first Deaf-led humanitarian aid group. While delivering audiological care and hearing aids, we have been overwhelmed by the sheer number of children needing support––hundreds of kids living in isolated silence without access to visual language. During this gala, we will be sharing our stories from the field, never-before-seen footage of the camps and information about the plight of these children. With a silent auction and respected speakers, you will surely leave this gala with more items and information than you thought possible.